Petrolia lawyer Wallace Lang questioned the amount of money wind energy companies are offering farmers who lease them land to build turbines on. Lang told more than 200 people gathered Thursday evening at Lambton Centennial School near Petrolia that the wind leases he has read typically offer landowners $15,000 a year, per turbine. 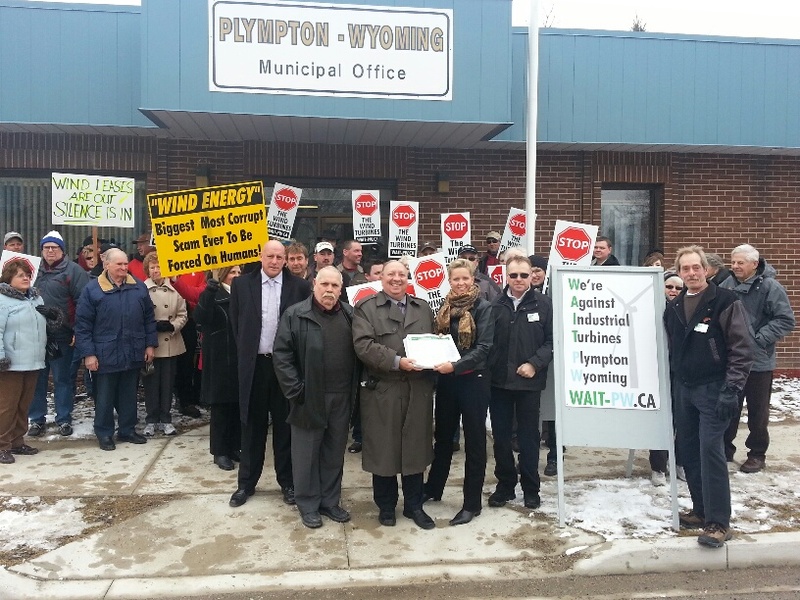 A court ruling that went against another municipality’s wind turbine setback bylaw could end up helping Plympton-Wyoming, says its lawyer. Suncor Energy has taken Plympton-Wyoming to court over wind turbine provisions in its bylaws, including a two-kilometre setback like the one in the Niagara-area municipality of Wainfleet Township an Ontario court recently said was invalid. “The decision gives some guidance that wasn’t available previously,” said lawyer Eric Gillespie. 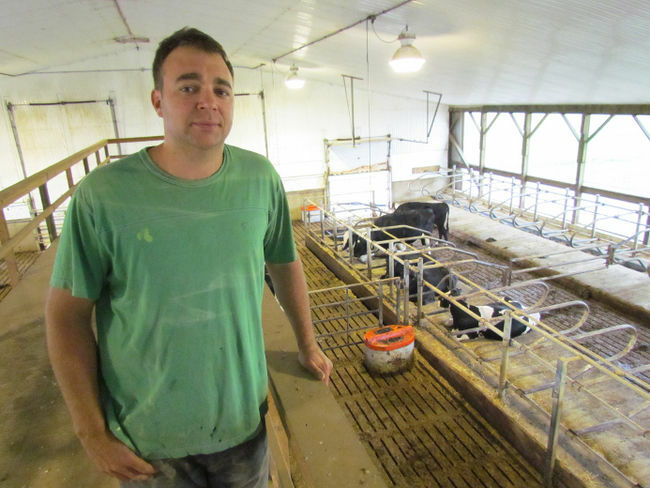 He was hired by Plympton-Wyoming to help it defend its bylaws against Suncor’s challenge. Gillespie said the judge in the Wainfleet case said municipalities have the ability to pass bylaws concerning industrial wind projects, so long as they don’t conflict with the province’s legislation. 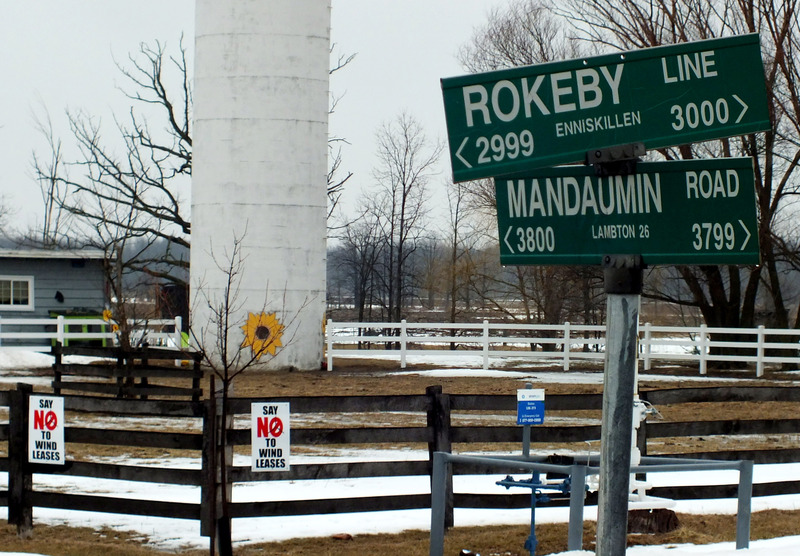 Enniskillen Township has joined a growing number of Ontario municipalities declaring that industrial wind farms aren’t welcome within their boundaries. Mayor Kevin Marriott said his council passed a motion this week calling itself an unwilling host, and he was at Queen’s Park in Toronto Thursday when Liberal and New Democrat MPPs defeated a Tory bill — 40 votes to 33 — that would have, among other measures, returned some local municipal control over wind projects. 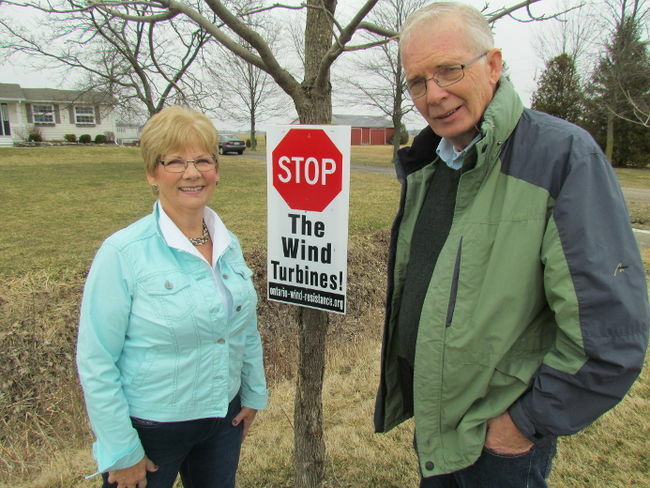 Several wind companies have been active in Enniskillen Township, looking for land to lease for turbine projects, and a citizens’ group has formed there to oppose them. At a press conference in Toronto before Thursday’s vote Marriott spoke about the division that wind turbines create in rural municipalities like his. “The Green Energy Act has been nothing short of a nightmare for our community,” he said of the provincial legislation that took away local municipal planning control over renewable energy projects. 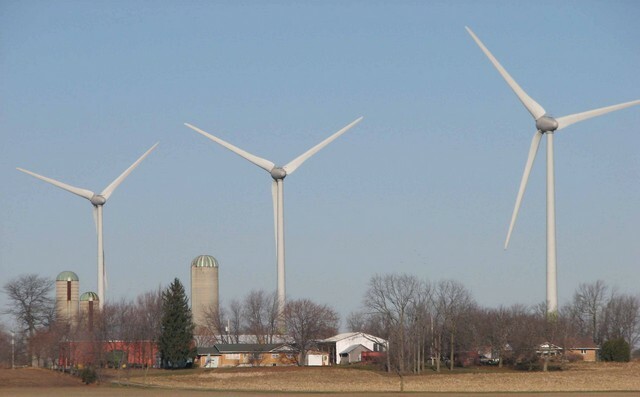 Plympton-Wyoming officials plan to consult with their lawyer over a recent court ruling that went against another Ontario municipality’s two-kilometre setback for wind turbines. Plympton-Wyoming is being sued by Suncor Energy over wind turbine provisions in its bylaws, including one that also calls for a two-kilometre setback. The province only requires wind turbines be built at least 550-metres away from neighbouring properties and its Green Energy Act took planning approval powers for renewable energy projects away from municipalities. A Superior Court of Ontario judge ruled Friday the setback bylaw in the Niagara-area municipality of Wainfleet Township is invalid. 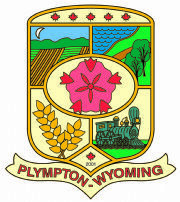 “We’ll be meeting, sooner than later, with our legal team and get some advice as to where we should go from here,” said Plympton-Wyoming Mayor Lonny Napper. 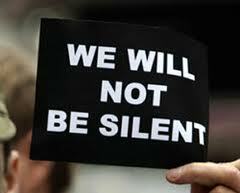 “I don’t think it would change our stance any. 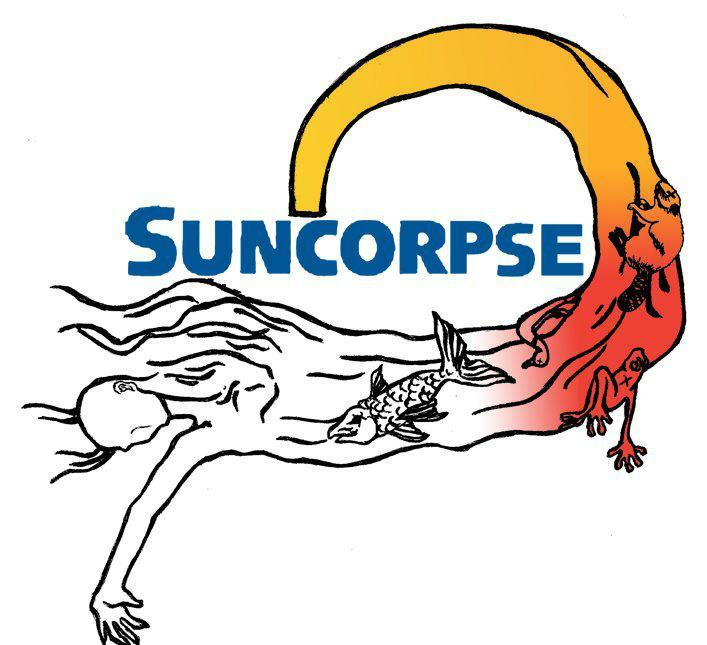 “Our request is simply to not use the corporation’s registered, trademarked logo in a manner that is defamatory,” NextEra spokesperson Josie Hernandez said in an email. Hernandez said company officials attempted to contact Wrightman personally to resolve the issue before the letter from the lawyers was sent. Wrightman said phone calls where made to her home but she never spoke directly to those company representatives. “We aren’t trying to limit debate, which is clear from our letter, but we have rights in our logo that are entitled to protection under the law,” Hernandez said. 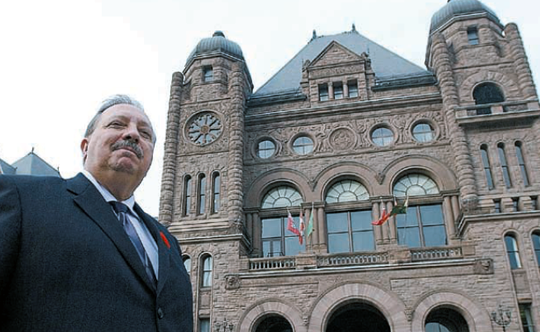 It was the Ontario government’s decision to close the Lambton Generating Station that convinced Larry O’Neill to tear up his Liberal Party membership card. The veteran municipal politician in Enniskillen Township, past county warden, former provincial Liberal candidate and long-time party worker calls himself an independent these days. The Liberal government’s decision to shut down the coal-fired plant didn’t make sense to O’Neill, just like its Green Energy Act and its rush to build wind farms in rural communities doesn’t make sense to the retired farmer and Chemical Valley worker who spent 16 years in municipal politics. Aamjiwnaang First Nation officials gathered Thursday to celebrate the community’s investment in a $380-million wind farm near Grand Bend. Aamjiwnaang and Bkejwanong First Nation at Walpole Island have each taken 25% shares in Northland Power’s Grand Bend Wind Farm project. 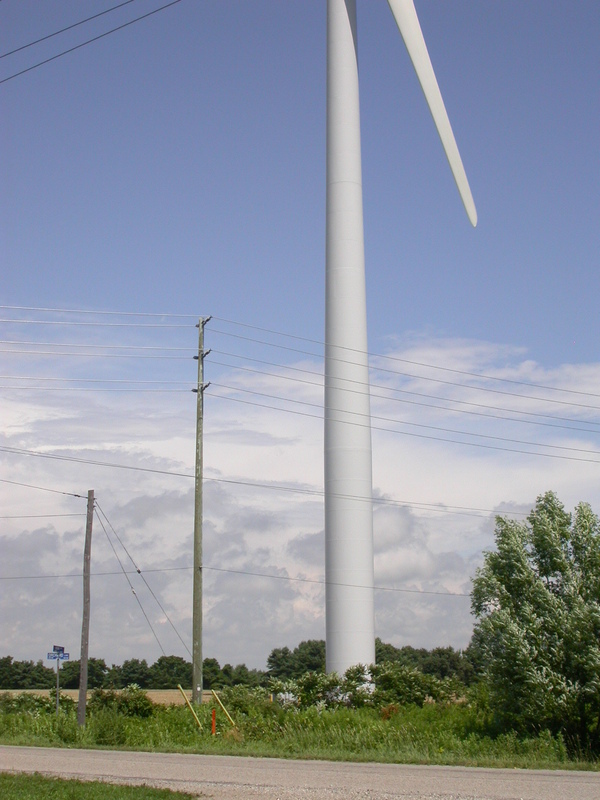 SARNIA – A concerned Lambton County resident is calling on the local public school board to support a moratorium on industrial wind turbines being built within the school board district. 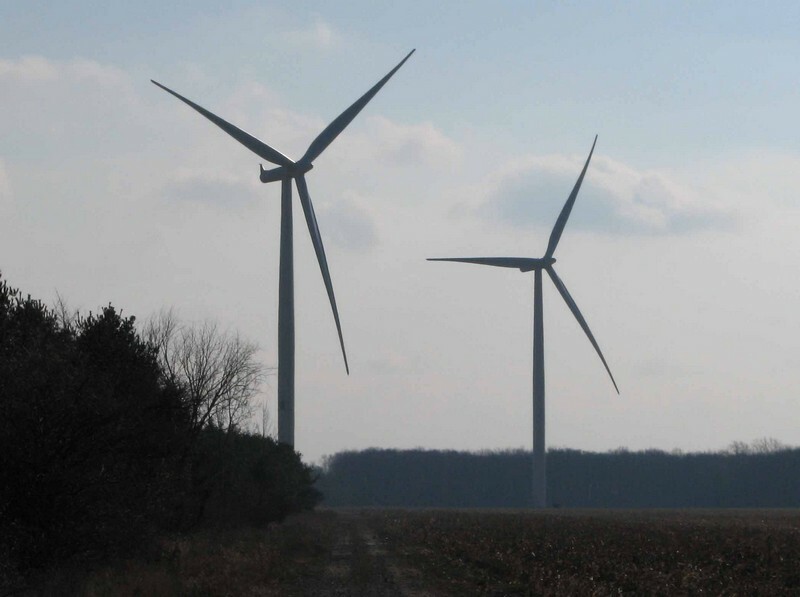 Plympton-Wyoming resident Keith Douglas said the board needs to act especially since wind projects are being proposed for sites near two Lambton Kent District schools. 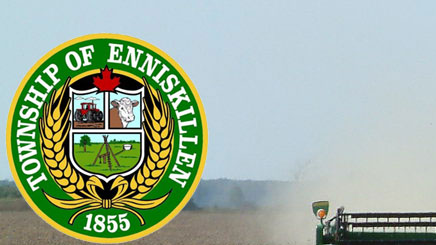 Citizens group forms in Enniskillen Township : C.O.R.E. Convincing landowners to turn down wind companies is the best way to keep Enniskillen Township free of wind turbines, says its mayor. 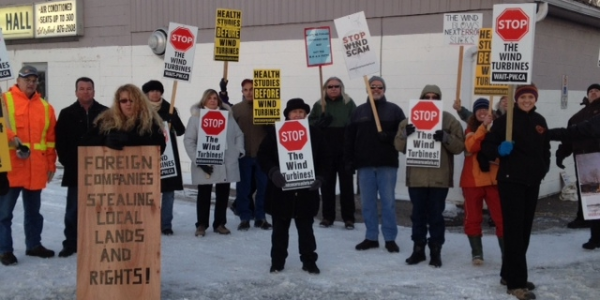 The rural township that surrounds Petrolia has been targeted by wind energy companies, leading to the forming of a citizens’ group opposed to wind turbines, as well as plenty of concern in the community. 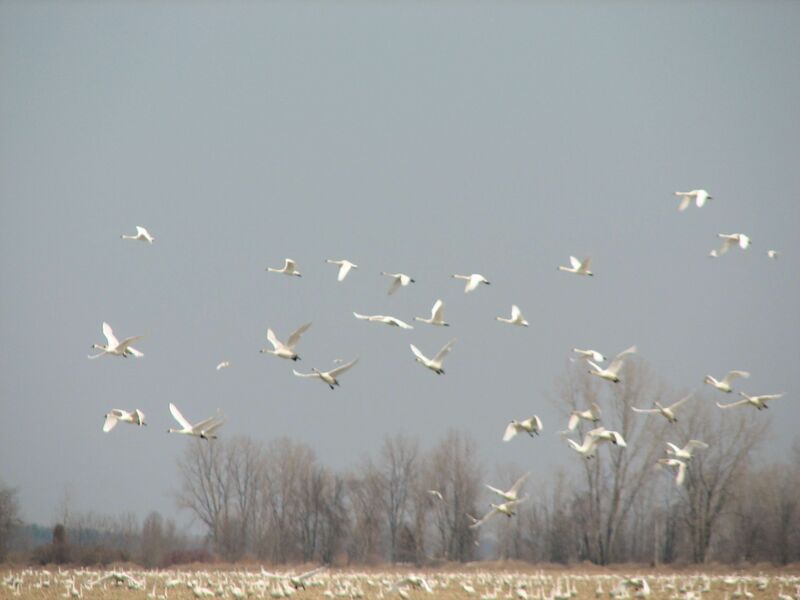 Tundra Swans fly over farm fields near the Lambton Heritage Museum earlier this month. The swans traditionally visit the area during their annual migration. 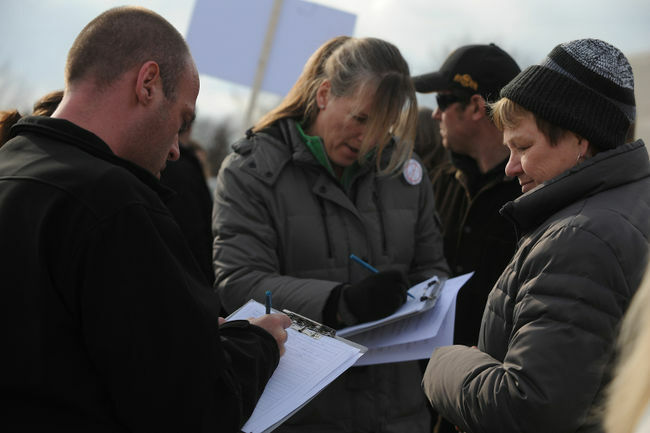 Members of the Middlesex-Lambton Wind Action Group plan to rally Sunday. 11 a.m. to 1 p.m., along Greenway Road in Lambton Shores to take their message to swan watchers. 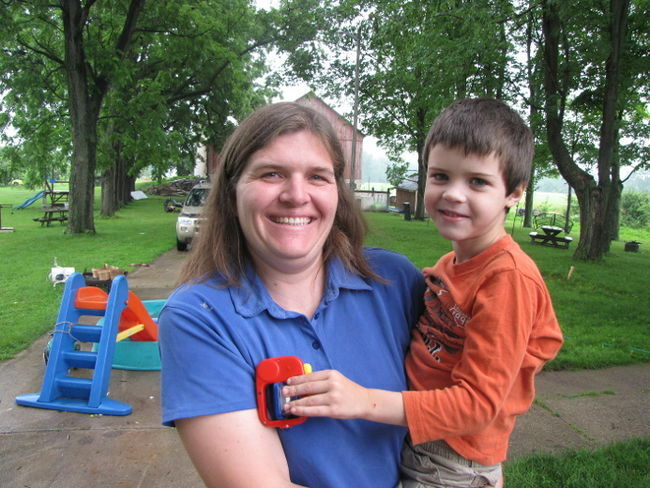 Muriel Allingham, with the Middlesex-Lambton Wind Action Group, said some of its members will out along Greenway Road from 11 a.m. to 1 p.m. to pass along information to the public. The road, near the Lambton Heritage Museum, is a popular spot to view tundra swans stopping over in the Thedford bog during their annual migration. The wind action group is fighting plans to build wind farms in the area, and says turbines could impede the swan’s migration. 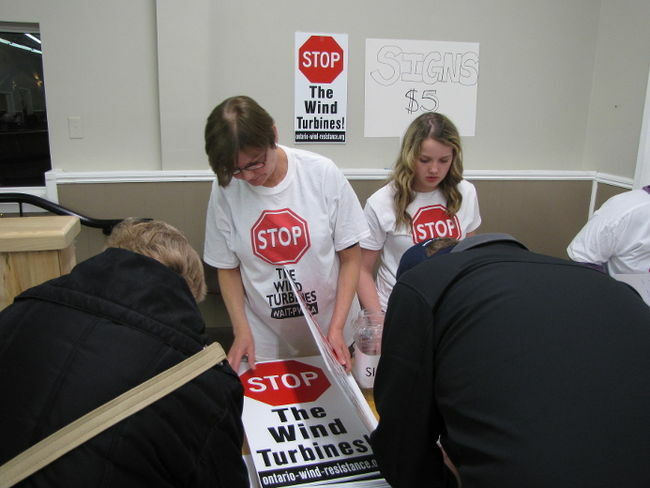 Anti-wind farm activists in Plympton-Wyoming say they plan to deliver a petition with more than 2,500 signatures Friday to Sarnia-Lambton MPP Bob Bailey. 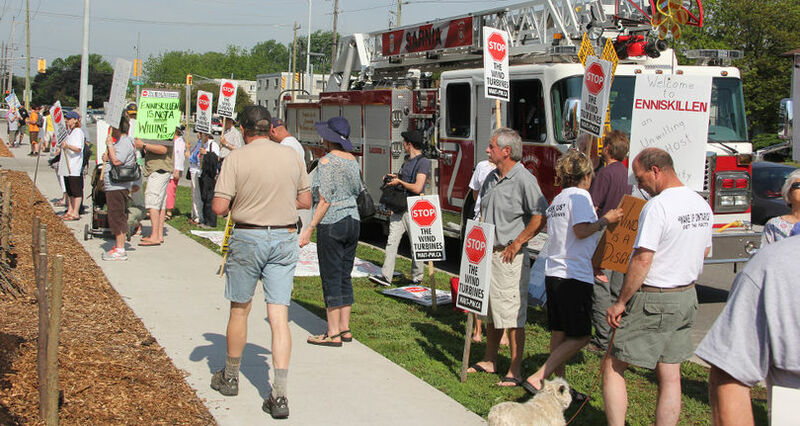 The group, We’re Against Industrial Turbines in Plympton-Wyoming (WAIT-PW), has been circulating the petition since forming to oppose Suncor Energy Products’ plan to build up to 46-turbines across a wide stretch of rural northern Lambton County. John Barros says it’s time for a new, and less divisive, approach to building wind farms. 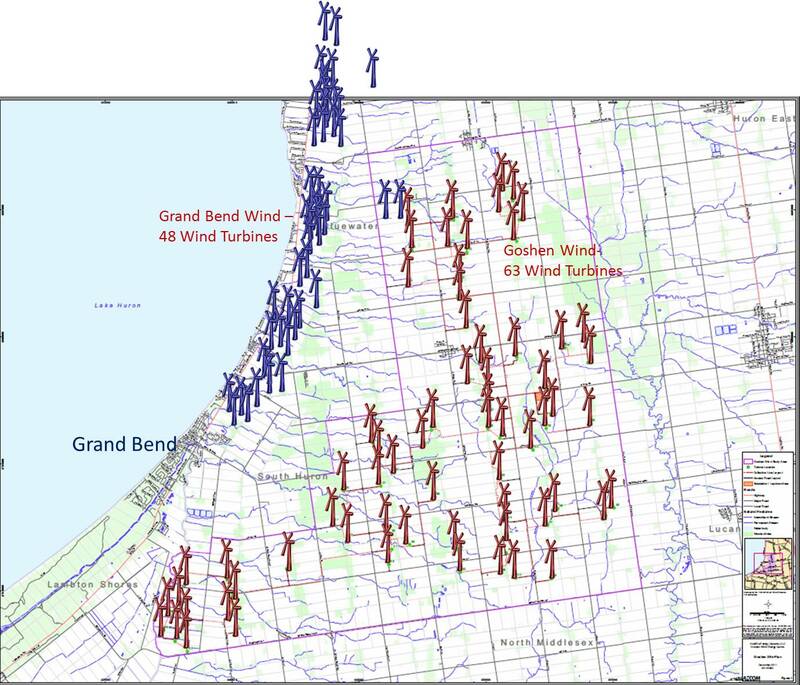 The senior project development manager for Mainstream Renewable Power said he wants everyone within the boundaries of its proposed Sydenham wind projects in southeastern Lambton County to be able to benefit from them. Landowners need to get advice before signing on with wind energy companies, says lawyer Wallace Lang. He was speaking to about 250 people gathered Thursday evening at a wind turbine public awareness meeting held at the community centre in Oil Springs. 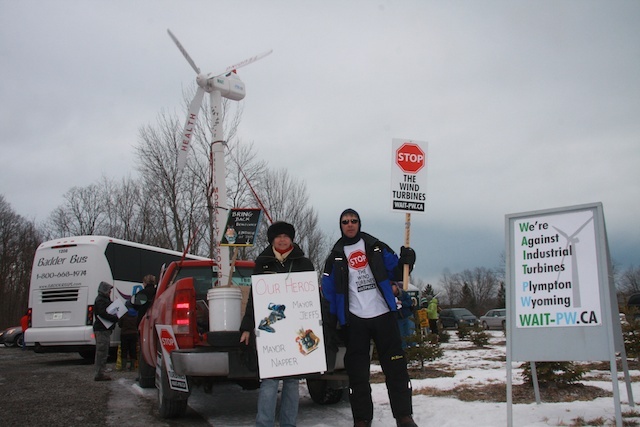 It was organized by Enniskillen Township resident Chad Burke and his family after representatives of wind companies began approaching landowners in the rural Lambton County community. 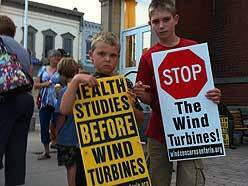 Mayor Kevin Marriott has said three companies are behind several proposals for wind farms in the township. The “divisive” wind energy debate is heating up in Enniskillen Township, says Mayor Kevin Marriott. Representatives of several wind companies have been approaching Enniskillen landowners, Marriott said. “I would say there are three (companies) involved” with projects proposed for sites across the rural central Lambton County township that surrounds Petrolia, he said. 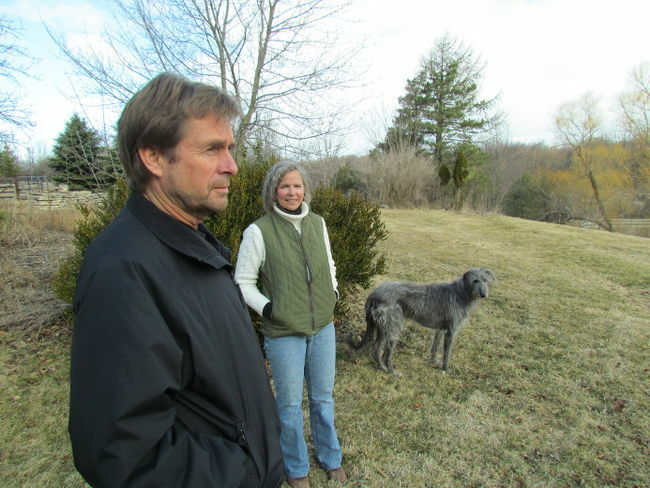 [excerpt] Property owners living with wind turbines on or near their land are watching for new study results expected by the end of February. MPAC (Municipal Property Assessment Corporation), the agency that sets property values for tax purposes, has taken a second look at whether wind turbines impact assessment. A similar study carried out in 2008 concluded there was no impact. However, the results could be different this time around because there have been more sales, more turbines and a larger area has been studied, said Tim Brown, MPAC’s manager of property values for special and institutional properties. He was a guest speaker at county council Wednesday and said assessed values are directly related to recent sale prices. 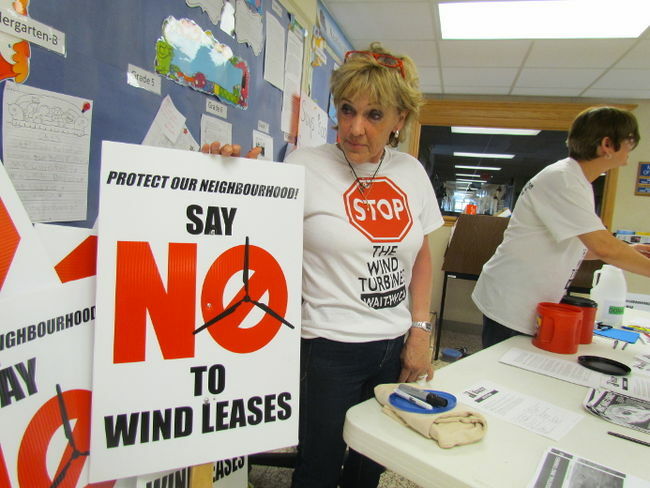 Members of the Middlesex-Lambton Wind Action Group and its supporters protested Wednesday evening at a public meeting Nextera held at Watford’s Centennial Hall. It was the first of three the company is holding this week. “We continue to protest, mostly just to show Nextera they aren’t welcome here,” said Esther Wrightman, with the wind action group, joined by about 25 other protesters. 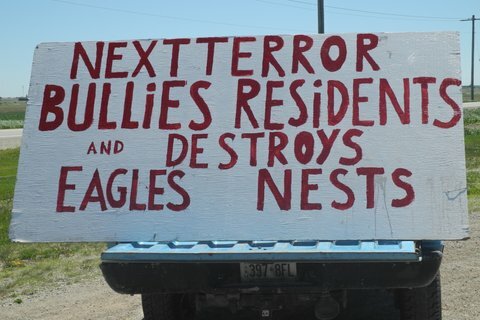 She said there’s “extreme opposition” in the community to the company’s plans.